Each box contains 200 arrow lock tags and a black permanent marker. Available in yellow, blue, orange, red and green. You will be contacted regarding payment within 1 business day. This is an economical fixed length plastic truck seal. Also called plastic car seals, these one time use seals are Ideal for securing trailer doors, containers, rail cars, and equipment. 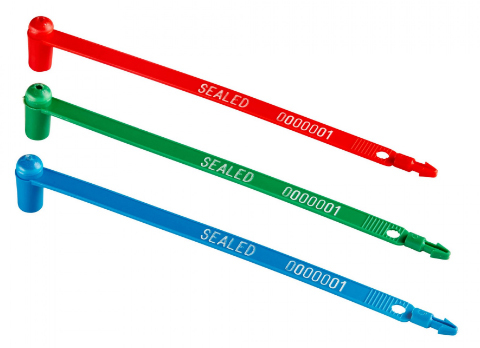 Security seals purchased online are printed "SEALED" and consecutively numbered. Additional discounts for higher quantity orders. Input the quantity you would like below and we will email a custom quote to you. Heavy duty plastic seals that are easily attached without tools and cannot be opened unless the seal is destroyed. Model HS75 and HS115 heavy duty plastic cargo seals are the strongest fixed length plastic security seals in the industry (135 lb breaking strength). Up to 16 spaces of print and 7 digits of numbering. Available in black, blue, green, orange, red, purple, white and yellow. 100 seals per bag.